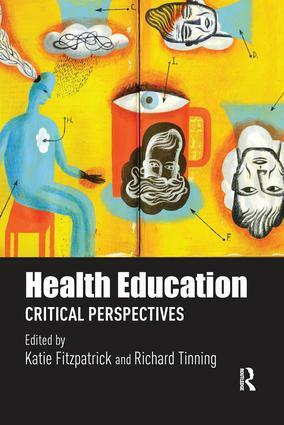 Health Education: Critical perspectives provides a socio-cultural and critical approach to health education. The book draws together international experts in the fields of health and education who deconstruct contemporary discourses and practices, and re-imagine a health education that both connects with young people and offers a way forward in addressing issues of health and wellbeing. Chapters within specifically link academic work on neoliberalism, healthism, risk and the body to wider discourses of health and health education. They challenge current practices and call for a re-thinking of current health programs in education settings. A unique feature of this book is the analyses of health education from both political and applied levels across a range of international contexts. alternative ways to think about health and health education pedagogy. The overall theme of the book offers a perspective that the current approach to health education – promoting a fear of ill health, self-surveillance and individual responsibility – can become a form of health fascism, and we need to be cognisant of this potential and its consequences for young people. The book will be of key interest to academics and researchers exploring the political context of health education. Social media: Virtual environments for constructing knowledge on health and bodies? The corporatization of health education curricula: “Part of the solution” to childhood obesity?